Does Visual Similarity Duplicate Image Finder support RAW formats? How to exclude a folder from auto-mark? How many images can I compare? Do you provide a library or dll that will find duplicates? Does Visual Similarity Duplicate Image Finder work on Mac OS? Can we compare scanned text and image documents? I have two 100% identical files and VSDIF does not detect them. What is the issue? VSDIF reports that some of my files can not be deleted. How can I solve this? Auto-check does not select any files, what is wrong? Auto-check vs Quick Check - what is the difference? Some of my duplicate images are not identified or the identified images are not similar - what is the wrong? How to search for similar images inside a folder using a sample image - Image Search? How does the CACHE feature work? The scan process is slow, how can I improve it? Yes. Visual Similarity Duplicate Image Finder supports most of the RAW formats available. You can see a list of the supported digital camera RAW formats here. Note that even if your camera is not listed it may be supported, so we recommend you to download our free demo and test your images. In the folders list tick the 'Disable Automark For This Folder' checkbox for the corresponding folder. 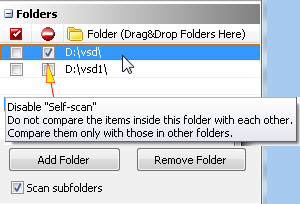 If you disable self-scan for folder 'VSD' the images inside it will not be compared against each-other - they will be compared only with images that are located in other folders. If you disable self-scan for the folders 'VSD' and 'VSD1' the images in 'VSD' will be compared against the images in 'VSD1' and vice-versa instead of comparing all the images in 'VSD' and 'VSD1' against each other. The folders that are disabled for self-scan will be listed in green. When minimized the application will minimize to the system tray in order not to disturb your work. Please look in the system tray for the Visual Similarity Duplicate Image Finder icon. There is no limit for the count of images that you can scan. Scanning huge databases of more than 500 000 images can be time consuming especially if the images are in RAW format and/or are in high resolution. Visual Similarity Duplicate Image Finder is extremely optimized in terms of CPU usage and will run fast even on a slower machine. The hardware that will affect the scan process the most is the performance of your storage. Currently we do not offer a library or DLL, but you can use the Visual Similarity Duplicate Image Finder Corporate in order to integrate it into your system. The corporate version provides a command line interface and can output the results in a text file. Take a look at the about page for more details. You will find command line parameters and sample output in the help file. Please download our demo for a live test. Unfortunately currently we do not have support for Mac OS. Yes you can. We have already customers that have integrated the product into their systems for such aim and compare automatically scanned data. The image also provides skew detection and will find duplicates even if the scan is poor. Due to the huge amount of data that the application processes it is possible to find damaged files in your image collection. What you can do? Make sure to use a NEW CACHE or NO CACHE for every new scan in the steps below. This can happen due to damaged images in your collection or due to images that are created by low-quality software which does not comply to the standards. In order to identify such images follow the steps below. Go to Option and check "Enable Logging"
Once the application freezes you can check the log file in "My Documents" folder to see which file started loading and could not complete. Just open the file in a text editor like NOTEPAD and search for all the occurrences of the word "ERROR". Please send the file to us for an analysis. Remove the file and run a scan - it will continue properly. If you still experience problems go to Options and un-check "Quick Load Images"
Run the scan again and repeat the steps from 4 to 6. If the steps above do not help, make sure that your drive is not broken and does not have physical errors. You can try running the ScanDisk application from Windows. Make sure that you have not set any filters and that the files are really scanned. Use the default settings for your scan. You can check them in this Duplicate Image Finder Tutorial or Uninstall/Install the tool to reset all settings to their defaults and try a scan. Another very likely cause for such issue is a poor antivirus or system optimization tool that may block access to your files. Disable such tools, restart your computer and retry. Access permissions could be another cause for the problem - make sure that the user account used to start VSDIF has sufficient permissions to access the target location. Note that using an Administrator account does not imply that it has access to all locations especially such located on network shares or external drives. The file is stored on a read-only media like CD-ROM - such media does not allow deleting or writing files. The file is in use - Close all applications and retry. If that does not help save your project, restart Windows and try to delete. There are not sufficient permissions to delete the file. The application is started with a user account that does not have permissions to delete the file - try to run as Administrator. There are errors in the file system - try to run the windows ScanDisk application on the problematic file location - drive. 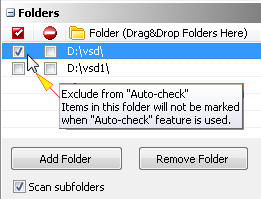 Most likely all or some folders are excluded from auto-check in the folders list. Go to the folders list and un-tick the "Exclude from auto-check" option for the desired folder. There are extra filters enabled in the advanced options. Go to the "Auto-check panel" and click the "Advanced..." button. Make sure that no filters are enabled. Click the "Uncheck all" button to uncheck all the extensions that are excluded and hit the "Ok" button. Retry the auto-check feature. Why there are two selection methods and what are the differences? "Auto-check" will automatically mark the files for deleting based on the selected options in the "Auto-check" panel and will not select any files that are located in the folders marked with the "Exclude from auto-check" option. It will select all files in a group and will ALWAYS KEEP ONE FILE UNCHECKED even if it matches the selected criteria - KEEP THE "ORIGINAL" file. Every consequential use of the auto-check option will reset the previously checked items and apply new selection based on the current auto-check settings. "Quick check" works in a slightly different way. It will select/deselect items based on the settings inside the "Quick check" panel. Using the "Quick check" feature the selection will be applied over the currently marked items. Unlike "Auto-check", "Quick check" will not clear the selection prior to applying the new selection. This makes it possible to combine multiple selection options. "Quick check" will keep unchecked copies of files inside a group only if they do not match the selected criteria. This means that unlike "Auto check" using "Quick check" may select/deselect all files in a group if they match the selected filters. "Quick load images" - this option which is disabled by default may cause incorrect results. While this option is effective and works perfectly it can not handle "bad images" that may be present in your photo collection. There are a lot of applications that do not comply with the standards and if you have used one to process or convert your images the resulting files may not behave properly in other application including VSDIF. If you are not sure about the quality of your images disable this option and retry the scan. Please note that you have to create a NEW CACHE file in order for the change to take effect. Another possible reason is that some files may be damaged. Try to save the files in another format or in the same format using different photo management tool and retry. If the issue is related to landscape photos then this is how VSDIF works. Landscape photos do not have enough detail in order for VSDIF to detect them as too different. In most cases a landscape photo consists of sky and land or sky and sea which is identified by VSDIF as very similar and actually that result is CORRECT - they are all very similar landscape photos. We recommend you to scan those separately using much higher similarity level like 99% so that the different scenes are grouped in different groups. VSDIF provides extremely optimized internal cache system. While scanning for similar and duplicate images the tool performs heavy computations and in order to provide better performance and reduce processing time for subsequent scans the results of those computations are stored in the cache system. This feature improves the scan performance dramatically as data for images that are already scanned is loaded and reused from the cache system. An intelligent algorithm checks the cached images for modifications and automatically updates them in the cache if necessary. On a fresh installation the tool is configured to use "Default" cache file so no changes from the user side are required in order to use the feature. If necessary a different cache file can be created and also the cache location can be set in the application settings. Setting up the cache file location on an SSD or other high-performance storage in order to further improve the scan speed is strongly recommended. The cache file is optimized in terms of memory usage too and does not require large amounts of disk space. While using the cache system the scan speed of subsequent scans can be 50 to 100 times faster depending on the image types, sizes and storage performance. Though available, using the "No cache" option is not recommended. Our tools provide the best precision without compromising the performance. You can test competitor tools in order to prove this claim for yourself. The scan speed depends mainly on the performance of your storage. This is because our detection algorithm is so optimized that images are compared faster than they can be loaded from your storage. So how to optimize then? Best thing to do is to store the files on a fast media like an SSD drive. If you have large volumes of images and that is not possible, VSDIF already includes plenty of performance optimizations - use the CACHE system which is enabled by default. There is an explanation how it works above. Though our tools support all types of storage devices and network locations, if performance is an issue avoid scanning slow media like CDs. Network locations may be slow too depending on your network settings and network storage configuration. In such cases the files can be copied locally on a fast media, scanned, cleaned and then moved back to the desired location.